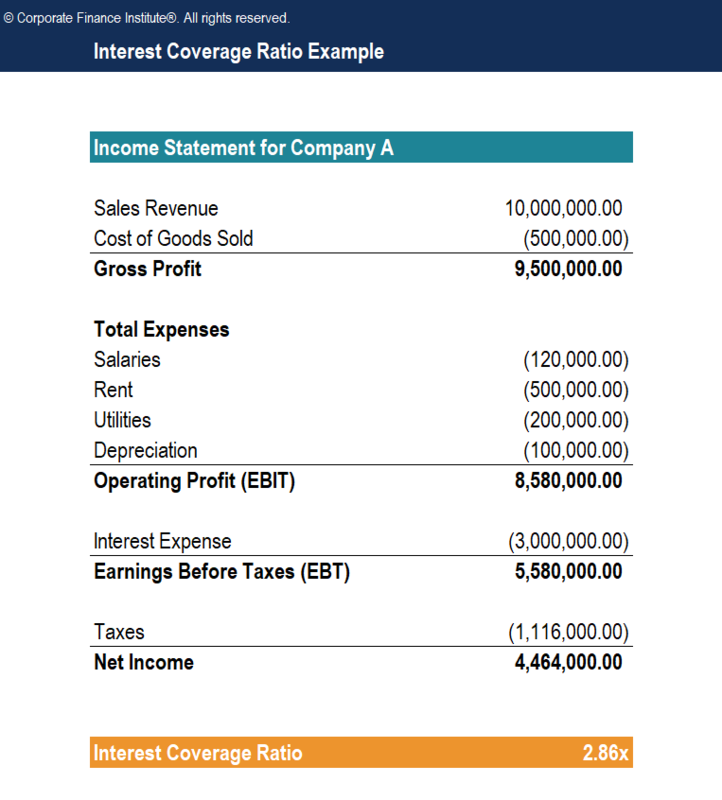 This Interest Coverage Ratio template will guide you through the calculation of interest coverage ratio using an income statement. What is Interest Coverage Ratio (ICR)? The Interest Coverage Ratio (ICR) is a financial ratio that is used to determine the ability of a company to pay the interest on its outstanding debtSenior and Subordinated DebtIn order to understand senior and subordinated debt, we must first review the capital stack. Capital stack ranks the priority of different sources of financing. Senior and subordinated debt refer to their rank in a company's capital stack. In the event of a liquidation, senior debt is paid out first. The ICR is commonly used by lendersTop Banks in the USAAccording to the US Federal Deposit Insurance Corporation, there were 6,799 FDIC-insured commercial banks in the USA as of February 2014. The country's central bank is the Federal Reserve Bank, which came into existence after the passage of the Federal Reserve Act in 1913, creditors, and investors to determine the riskiness of lending capital to a company. The interest coverage ratio is also called the “times interest earned” ratio. The lower the interest coverage ratio, the greater the company’s debt and the possibility of bankruptcyBankruptcyBankruptcy is the legal status of a human or a non-human entity (a firm or a government agency) that is unable to repay its outstanding debts to creditors. Generally, it is initiated by the debtor and imposed by a court. Intuitively, a lower ICR indicates that less operating profits are available to meet interest payments and that the company is more vulnerable to volatile interest rates. Therefore, a higher interest coverage ratio indicates stronger financial health – the company is more capable of meeting interest obligations. However, a high ICR may also indicate that a company is overlooking opportunities to magnify their earnings through leverage. As a rule of thumb, an interest coverage ratio above 2 is considered the minimum acceptable amount. In some cases, analysts would like to see an ICR above 3. An ICR below 1 indicates that a company is not able to pay off its current interest payment obligations and is therefore in poor financial health.